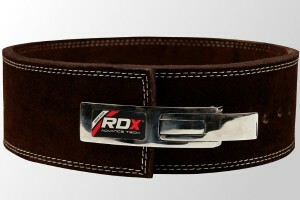 The RDX Cow Hide Belt is a 4 inch wide and 10mm thick belt and on first appearances it looks very different to a standard black leather lifting belt. It has a soft suede-like finish made from a high quality leather and looks almost fluffy from a distance and is actually very nice to hold. The white double stitching is a nice contrast to the golden brown cow hide leather and the RDX lettering on the front it sure to grab some attention in the gym. 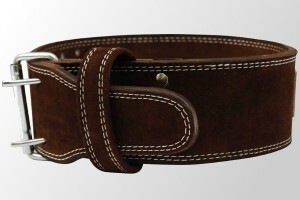 The belt is made up of 4 layers of oil tanned (hence the brown colour) Nubuck cow hide leather. The unique oil tanning process makes the belt soft and yet durable at the same time. It is available in both a double pronged buckle and lever variations. People have their preferences with both versions and each have their pros and cons. Buckle belts are easier to adjust and share with other people, leverbelts are easier to put on, take off and get a tight fit. We received our belt in a long box. Inside, the belt was transported flat. You get a feeling of quality when first touching this belt. Its external softness and even softer inside is great to feel but it also feels very durable at the same time. This is probably the highest quality RDX we have seen to date. On the buckle version the buckles seem to made of a sturdy metal along with the rivets of the reverse of the belt holding it in place. The end of the belt tapers in to fit into the loop during wear. This is only a small thing but when you wear the same belt for a few years, small things like this matter. The loop to secure any leftover belt when it is being worn is a little larger than the average belt and so sticks out a bit more but this is nothing to worry about. The lever version of the belt is made from the same material as the buckle version and it has the same double stitching. It features a very solid feeling lever mechanism. Now the lever feels like it will be able to handle most weights not problem but it does not feel a robust as the Inzer lever mechanism but this is a much cheaper belt. Also when secured with the lever, the belts don’t quite overlap on top of each other. This is only a minor thing for those with OCD. The only qualm we had about the quality is the stitching around the RDX lettering, it seems not be consistent between the two belts. This is probably as the belts are hand made. The belts sizes (as with many belts) are a little off and seem to be larger than stated on their description. So for this, we recommend getting one size smaller than you think that you would need. Once we got the right sized belt we found that the belt is nicer to wear when new compared to many other belts we have previously reviewed. On wearing, it seemed just right, stiff enough but not too hard. When compared to other belts this was easier to break in and fits the body’s contours relatively quickly. The lever version is easy to put on and take off and works smoothly. This is good if you are one of those people who get frustrated with messing about with a buckle. But the lever mechanism version requires a screwdriver to adjust the size. So this cannot be easily changed between sets like you would with a buckle. The wear in period for many belts takes a long time, even a few months of gym abuse does not fully wear in some of them. 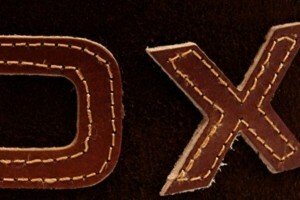 The RDX cow hide however wore in very quickly in comparison. In fact, if you wanted to wear it in quickly, you could wear it around the house for a day and it should be nicely contoured to you body by the end of the day. This belt is softer than many others and feels much nicer against the body but don’t let you think that it is not strong. Because it is very robust! Being the same width all around, it gives plenty of support for those heavy squats and doesn’t feel much if at all different from one of the belts which are thicker and harder to manage. For deadlifts is where this belt is brilliant. A lot of people have problems with stiff belts for deadlifts as they can dig into the sides when bending over. The softer edges of this belt means this doesn’t happen. Also being a 10mm belt rather than 13mm means that it is more flexible in this way. The lever version of the belt can create a nice tight fit for those that like the squashed feeling. 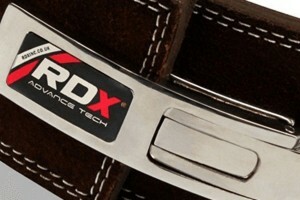 The RDX belt is quite different from a normal powerlifting belt due to soft it’s appearance and feel. But it should not be considered to be weak. Far from it in fact. It is superbly study providing just as much support as it’s stiffer counterparts. The lever version has a sturdy and smooth mechanism achieving a solid tightness while the double pronged buckle variety matches the performance of other belts. This really is exceptional value for money. Great review!! I’m going to give this one a try. I want to see if the softness of the belt helps my old back.